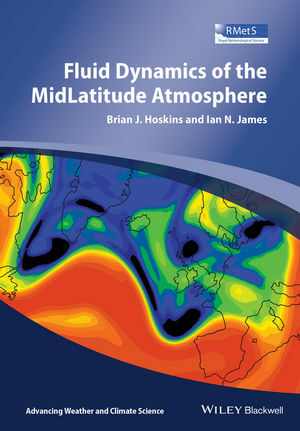 This book gives a coherent development of the current understanding of the fluid dynamics of the middle latitude atmosphere. It is primarily aimed at post-graduate and advanced undergraduate level students and does not assume any previous knowledge of fluid mechanics, meteorology or atmospheric science. The book will be an invaluable resource for any quantitative atmospheric scientist who wishes to increase their understanding of the subject. The importance of the rotation of the Earth and the stable stratification of its atmosphere, with their implications for the balance of larger-scale flows, is highlighted throughout. Clearly structured throughout, the first of three themes deals with the development of the basic equations for an atmosphere on a rotating, spherical planet and discusses scale analyses of these equations. The second theme explores the importance of rotation and introduces vorticity and potential vorticity, as well as turbulence. In the third theme, the concepts developed in the first two themes are used to give an understanding of balanced motion in real atmospheric phenomena. It starts with quasi-geostrophic theory and moves on to linear and nonlinear theories for mid-latitude weather systems and their fronts. The potential vorticity perspective on weather systems is highlighted with a discussion of the Rossby wave propagation and potential vorticity mixing covered in the final chapter. Having gained mathematics degrees from Cambridge and spent some post-doc years in the USA, Brian Hoskins has been at the University of Reading for more than 40 years, being made a professor in 1981, and also more recently has led a climate institute at Imperial College London. His international activities have included being President of IAMAS and Vice-Chair of the JSC for WCRP. He is a member of the science academies of the UK, Europe, USA and China, he has received the top awards of both the Royal and American Meteorological Societies, the Vilhelm Bjerknes medal of the EGU and the Buys Ballot Medal, and he was knighted in 2007. From a background in physics and astronomy, Ian James worked in the geophysical fluid dynamics laboratory of the Meteorological Office before joining the University of Reading in 1979. During his 31 years in the Reading meteorology department, he has taught courses in dynamical meteorology and global atmospheric circulation. In 1998, he was awarded the Buchan Prize of the Royal Meteorological Society for his work on low frequency atmospheric variability. He has been President of the Dynamical Meteorology Commission of IAMAS, vice president of the Royal Meteorological Society, and currently edits the journal Atmospheric Science Letters. He now serves as an Anglican priest in Cumbria.